There's still lots of room to grow for these three companies. Here's what makes them good buys now. To many investors, mid-cap stocks have an uncomfortable in-between status. Large-cap stocks represent the tried-and-true businesses that dominate our landscape. Meanwhile, small-cap stocks are a growth investor's dream. But this month, it's worth looking at the middle ground. After all, every company that has gone on to produce multibagger returns was, at one point, a mid-cap stock. Our Foolish contributors recently sat down to pick three mid-caps that are worthy of your consideration this June: SS&C Technologies (NASDAQ:SSNC), Bitauto Holdings (NYSE:BITA), and Buffalo Wild Wings (NASDAQ:BWLD). We're focusing on companies transitioning into big-time players. Image source: Getty Images. Brian Feroldi (SS&C Technologies): It takes a lot of computing power to run a successful financial company these days. That's why many hedge funds, pension funds, mutual funds, and more all look for help with operating their mission-critical back-office functions. 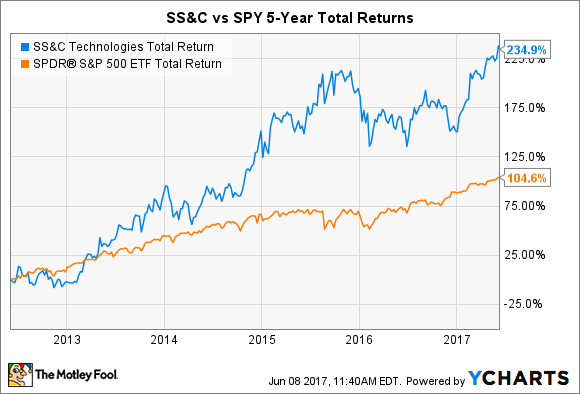 This is an area in which SS&C Technologies excels, which is why scores of financial companies seek out its assistance. SS&C provides these financial companies with a range of solutions. Some customers want access to the company's software while others want to outsource a large portion of their back-office operations. Either way, SS&C wins. What's more, once a customer signs on with SS&C, they tend to stick with it for a long time. That provides SS&C with a sticky user base and lots of recurring revenue. Thanks to solid organic growth and a series of acquisitions, SS&C's top line has expanded greatly over the last few years. When combined with the company's knack for expanding margins, it is easy to understand why its stock has handily thumped the market over the past several years. SSNC Total Return Price data by YCharts. Looking ahead, SS&C continues to look poised for growth as it improves margins, makes tuck-in acquisitions, and pushes through regular price increases. Market watchers expect the company's bottom line to expand by more than 15% annually over the next five years. And yet, in spite of all the positives listed above, SS&C's stock is currently trading around 17 times forward earnings. That's a bargain in my book, which is why I think that SS&C is a great stock for mid-cap investors to get to know. Brian Stoffel (Bitauto): China is about fifteen years behind the United States when it comes to citizens using the internet. That provides an enormous opportunity to learn from what has worked stateside, and applying it early and often in the Middle Kingdom. My stock for the month, Bitauto, is trying to benefit from this knowledge. Bitauto got its start by providing an advertising and showroom platform for Chinese auto dealers via the internet. That has traditionally been the bread-and-butter for the company. But over the past two years, an entirely new business line has sprouted up: a financing platform that connects car buyers with dealers and finance companies. As you can see, in the span of just two years' time, the financing platform has grown sales by almost 2,000%, from just $4.5 million in revenue in the first quarter of 2015 to over $90 million in the most recent quarter. Crucially, this platform benefits from the network effect: As more dealers use Bitauto to obtain financing for their customers, more providers are incentivized to join, which pushes even more dealers into the network. It's a virtuous cycle. The company is currently valued at $2 billion, which puts it on the low end of mid-cap stocks, but I believe it has the potential to be a huge winner over a decadeslong time frame in China. Steve Symington (Buffalo Wild Wings): The company's latest quarter might not have looked appetizing at first glance, but I think investors should be hungry to pick up shares of the wings, beer, and sports-centric restaurant chain this month. More specifically, Buffalo Wild Wings' revenue in the first quarter climbed a modest 5.2% year over year to $534.8 million, while earnings per share declined by nearly a third to $1.25. To blame for that bottom-line decline, according to B-Dubs, was a combination of higher labor and operating expenses, the popularity of its new Half-Price Wing Tuesdays promotion, and higher traditional wing prices. However, Buffalo Wild Wings is rightly pleased that it's keeping diners coming back for more. Same-store sales growth last quarter swung to a positive 0.5% and 0.6% at company-owned and franchised locations, respectively, outperforming the negative comps currently being endured by the broader restaurant and casual dining segments. Buffalo Wild Wings also enlisted the help of private equity firm The Cypress Group last quarter, tasking it with performing a "thorough review" of the business to streamline costs and improve operating efficiency. If all goes as planned, that review should generate $40 million to $50 million in cost savings over the next couple of years. In addition, the company is testing smaller-footprint locations to be opened in densely populated areas to focus on takeout and delivery -- two massive opportunities for incremental growth as more diners often opt to eat at home. Investors should also consider Buffalo Wild Wings' controlling stake in fast-casual chain R Taco, for which it plans to open two company-owned and 12 to 15 franchised locations this year. That rivals the company's plan to open 15 company-owned and 15 franchised Buffalo Wild Wings locations in the U.S. this year, and speaks to the effectiveness and relative outperformance of the budding brand. That's not to say's it's all been smooth sailing. Shareholders effectively voted late last month to shake up Buffalo Wild Wings' board of directors, approving three of four board nominees proposed by activist investor Marcato Capital. Longtime CEO Sally Smith announced her retirement shortly thereafter -- something I was personally saddened to hear. But I think Buffalo Wild Wings' long-term story still holds. And as Buffalo Wild Wings works to tackle the changing dining industry landscape, patient shareholders should be rewarded handsomely in the process. Buying shares of any one of these three is far from a sure thing, but each has the track record -- and growth runway -- to graduate from mid to large cap and enrich you in the process.